The sleazy motel, by the way, was a TraveLodge in the mid-'60s. SLU put us up there when my old man came in for his original interview. Travel Lodge. Is that the old hotel that was located on the South side of Lindell (is it called Olive East of Grand??) which is now where the baseball field, and open space before it, is located? Was sure glad to see that eye sore and crime magnet go away. intersection of Hampton and Chippewa. Used to go there all the time as a kid. Never knew what happened to it till I did a search on it a few months ago and found out it moved to grand center. Brooklyn Bridge Pizza at Hampton and Chippewa was awesome. As a kid it was one of my favorite pizza places. It was across from the old Peaches record store which had the hand and footprints in the concrete of all the Rock Starts. Great place. Mercantile Bank replaced either or both Loewe's mid city (movie theatre) and Katz Drugs where they always sold Busch six packs for 88 cents to help kill off Falstaff from being t.he most popular beer in St. Louis prior to the great "headache beer" rumor. Anyone have any insight as to what's happening with the northwest corner of Vandeventer and Kingshighway? The vacant building that was there was torn down. Does SLU own this land? The great Jeannie Trevor use to play in their lounge back in the day. It's owned by CORTEX, which is a group responsible for bringing life sciences companies to the corridor between SLU and Wash U. They tore the building down but do not currently have any plans to build anything on the site. No doubt. Loved that stuff as a kid. Moms deli, brooklyn bridge, donut drive in, Ted drewes...good area to grow up in as a kid. Hitting all the major food groups. ... and by Kingshighway I actually meant Forest Park Parkway... my bad. Thanks for the insight. Found a one-sided viewpoint website of the land. Warning: This website is for nut-jobs that think OLD ABANDONED Buildings should remain as eye-sore's for us all to enjoy. According to today's Business Journal, Dooley's - which was an awesome downtown hamburger joint for several decades - is reopening in Grand Center, just north of the Fox Theater at Grand and Washington. Their burgers were great, but also the space that it was in was just awesome I thought. I think that was part of the whole experience. Still, I'm glad to see that this place is coming back. Do you know which building they will be in? Sounds like Bill Shakespeare's Gastropub. Black paint. Slightly off topic: Has anyone ever eaten at Cafe Pintxos? I have passed by it a few times walking between Fieldhouse and Chaifetz, and it always seemed less than busy in there. Just curious. 2) I have not, but I think it's mostly a tapas place. -is this the place to ask if the pevely smokestack is still standing? 1) The smokestack was still up as of yesterday afternoon. 2) Cafe Pintxos has been struggling for an identity ever since it opened. Lack of a kitchen was a definite impediment for a restaurant. I don't think it's even claiming to do tapas (pintxos are a Basque, skewered form of tapas) anymore. Pretty space, though. It all sounds nice now, compared to the neighborhood around the campus in the 60's. I remember when some guys jumped Bob "Bevo" Nordman one night on Grand near the Fox. Bevo was 6' 10", about 280 lbs., that made everyone scared if the hoods were not afraid of him. 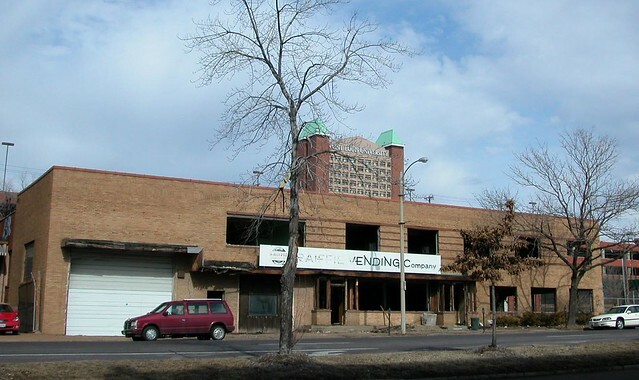 Anyone know what the nice art deco Borbein-Young building on the north side of Forest Park Ave, between Grand & Vandeventer looks like now? I worked in the warehouse in the back unloading truck parts a couple of summers with a real blue collar slice of life back in my student days. The office building was cool air conditioned, the warehouse was not. Was it just a little bit east of Spring? If it's the building I'm thinking of, it was recently demolished. There are plans to build a hotel on that lot, although I think the developers are struggling to get financing. Is this the building you're thinking of? Yes, thanks Box, that was it. It looked pretty nice 50 years ago. Sad to think all the fun guys I worked with then are gone now.